As a last article about designing transmission-line transformers I present a practical example aiming at adapting a whip antenna to a 50ohm/100W system using a Ruthroff 1:9 transformer and a common-mode RF choke. 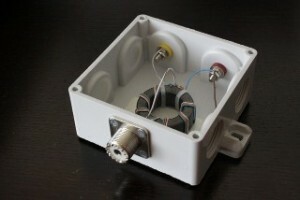 I have chosen the well known Amidon FT140-43 core for transformer and FT240-43 for RF choke. We see that this value is above the maximum value recomended by the vendor and therefore we need to increase the number of turns. Therefore we will use 7turns. The above formula is for continue power and could be improved in the case of manual keying and depending on the modulation type. For SSB the multiplying factor is K=3.2. 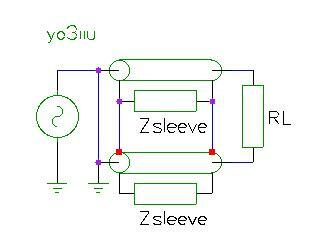 With the new chosen number of turns (7 turns) we could now calculate the maximum allowed voltage due to induction. All calculations are presented in the table below. It is easily seen that lines corresponding to first two frequencies in the table gives maximum voltage due to induction less than the voltage for maximum power (71V) and therefore we should increase the number of turns further or use a bigger core. 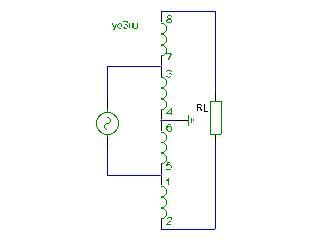 Remember that for Ruthroff 1:9 we calculated optimum impedance of the upper transmission-line as being 150ohm and for lower transmission-line 75ohm. Let’s see how close we are if we use closely coil three wires on the core. We could see that there is a mismatch between the optimum characteristic impedance and the impedance of the cables. 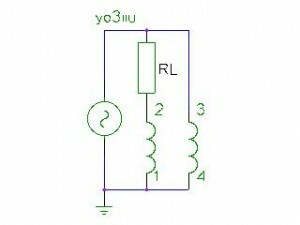 An Excel file with all calculations in this article could be found in wideband_transformers.xls. This transformer has been realized in practice and used extensively on the field with a whip antenna. In the previous post I derived formulas that could be used to calculate inductors on ferrite and iron powder cores. 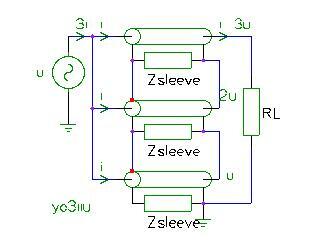 In this chapter I present various types of transmission-line transformers. The goal in designing a good transmission-line transformer is to make it usable in matching generator with the load over a broad range of frequencies, therefore making it a wideband transformer. 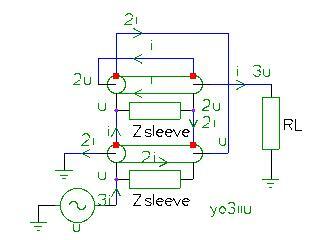 – transformers based on induction in the core. 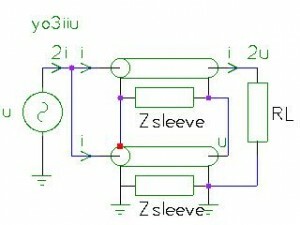 – transformers based on transmission line techniques that use the core only to isolate the output from input. One could employ a regular transformer design with primary winding and secondary winding on a ferrite core so that the impedance is matched between the generator and the load but it turns out that the more the number of turns is, the more parasitic capacities are and therefore the cutoff frequency for the transformer is lowered. A core with high permeability could be used to reduce the number of turns and therefore to reduce the parasitic capacities. Since this type of transformer is based on the magnetic flux inside the core, any leakage in the flux will be seen as a loss. 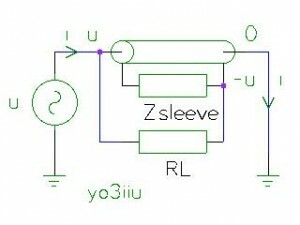 Coupling between primary winding and secondary winding is much more important and one could use different winding techniques in order to make the coupling better. For example primary and secondary winding could be put together when rolled on the core. 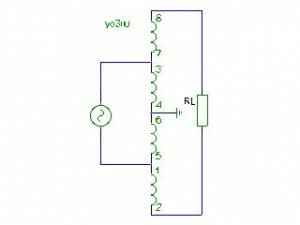 This is a transformer made by RF-systems in 1988 and registered to that name (MLB). 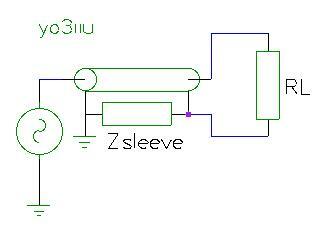 They claim to use a special ferrite to obtain a broad frequency range (0.1 to 40Mhz) in matching a longwire antenna. 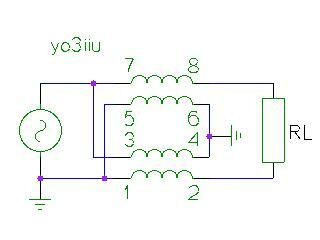 It is actually a 1:3 voltage UnUn. This type of induction transformer is based on principle of two currents producing same value of induction in the core but with oposite directions so that inductions will cancel each other. This is exactly what happens inside a transmission line and therefore it is also known as a transmission-line transformer. This design was called by Guanella (see below) Basic building block. – Currents in the coupled conductors of a transmission-line are equal in magnitude but opposite in phase (total coupling rule). – For every transmission-line the output voltage will be identical (magnitude and phase) to the input voltage (no loss rule). 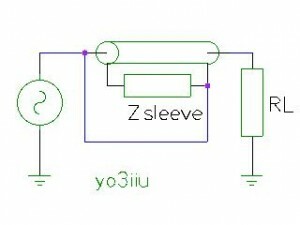 – There is no other connection between the transformer input and output other than through the transmission-line (total decoupling rule). Since the output is partially added to the input ( Bootstrap effect), this kind of design is more prone to errors when there is a unbalance in the load. The various designs based on Guanella and Ruthroff will be discussed further on in this chapter. It can be seen that is at potential so that it become in parallel with the generator. It is interesting that the is given by the upper transmission-line since the lower transmission-line will have no differential voltage between its ends. The two windings could be done also on the same core. For optimum transfer we need transmission lines with different characteristic impedance. 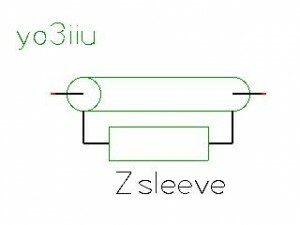 What we could see from the picture is that the outer conductor of the two transmission-lines are connected together, therefore they could be put on the same core. – permeability of the cable dielectric (we’ll discuss it in the next chapter). 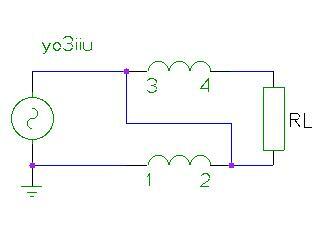 If D become larger then the characteristic impedance will raise. Therefore one can improve impedance matching by using isolator tubes around winding cables. 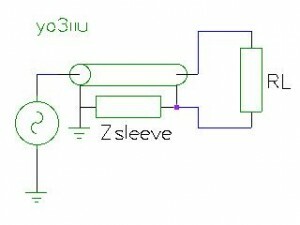 I write a series of articles about transmission-line transformers with the intention to eventually build a UnUn and current choke for a whip antenna. The first article will present the theory of magnetic core used in transmission-line transformers, the second article will present transmission-line transformer types together with their characteristics while the third article will present practical calculation of the UnUn and current choke using easy to find materials. 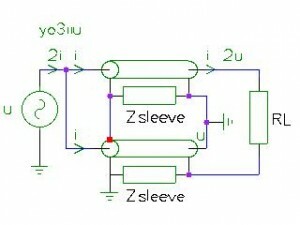 A transmission-line transformer aims at adapting from a transmission line with one impedance to a transmission line with another impedance. – remanent induction (induction in the material at zero magnetic field). – coercitive magnetic field (magnetic field at zero induction. saturation induction (maximum induction in the material). One important note regarding the is that it is normally calculated at low frequency but since it is dependent of permeability we should not expect it to be constant at all frequencies. I will discuss dependency of versus frequency in more details later in this post. We see that this depends on the frequency, number of turns, effective area of core. Some ferrite vendors offer a plot or a table of maximum inductance versus frequency. In order to verify that core is suitable for the application, one should calculate at minimum frequency and compare with the value in the table offered by the vendor. If is larger than the value in the table then a core with a larger should be chosen or the number of turns should be increased. Some ferrite vendors offer graphics for and versus frequency. From these tables one could calculate and . We could now derive the inductance and impedance of a core using the complex permeability and see how this could be calculated using the information that is usually provided by the core vendors. We will try to obtain another factor that is not dependent of frequency. where is a form factor not frequency dependent. – directly from the dimensions of the core. Increase in temperature can be calculated as follows where is thermal resistance of the core.
. In this formula V is the volume of the core. Some ferrite and iron powder vendors offer a formula to calculate temperature raise from max power dissipation and input power . We’ll use that in the last article when practically calculating a UnUn transformer. We determined maximum dissipated power for a specific raise in temperature. 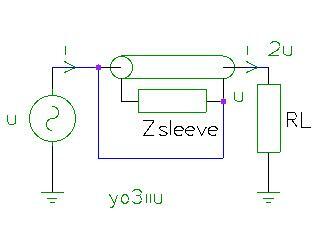 Now we can calculate the maximum allowed voltage to produce the maximum power dissipation. Which one to choose between and ? The smallest one in order to be on the safe side.